If you work with or are thinking of working with PVC, you are not alone. Rigid and flexible PVC, or polyvinyl chloride, is one of the most popular thermoplastics, prized for its strength, appearance and great resistance to fire, oil and other environmental hazards. PVC is used in manufacturing products such as tents, billboards, awnings and tarps. If you are in or considering getting into one of these manufacturing areas, one of the challenges you face is how to effectively join two pieces of PVC. PVC welders must be able to effectively seal your materials together without damaging the fabric or creating a noticeable seam. MarkPeri provides industry-leading PVC RF welders that are durable, reliable, and effective. Contact us directly today so we can learn more about your specific equipment needs and provide a lasting solution. If you are in a manufacturing business that uses PVC and need an effective welding machine, we believe that you will find Radio Frequency bar welders to be the perfect answer. 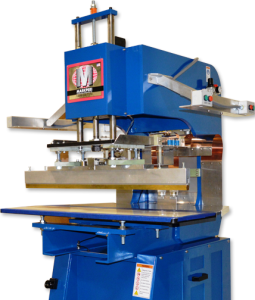 At MarkPeri, we have sold countless RF bar welding machines, including high-quality refurbished machines that work like new, to companies that work with PVC and other thermoplastics. The process is simple. Our machines use heated bars to soften the PVC at the point of joining and seal them together using the pressure of the bar against the thermoplastic. The machine generates the heat needed using radio waves in much the same way your microwave uses wave radiation to safely and effectively heat the foods you eat. Why Should You Use RF Bar Welders When You Need Plastic Welding Machines? Cost– Our RF bar welders are highly affordable, especially if you choose one of our more economical refurbished RF bar welding machines. Safer for Your Material– The process of RF bar welding is designed to maximize sealing while minimizing the likelihood of damaging other parts of your material. Environmental Concerns– Welding your PVC with one of our RF bar welders will not generate any toxic smoke that could damage the environment. Results– The end result of sealing PVC with an RF bar welder is a smooth, streamlined product that you will be proud to show your customers. Making the decision to purchase RF bar welders for your manufacturing company is often a wise decision, but it’s important that you find the right supplier for your RF bar welders to get the best results. We can say with confidence that you can trust 3KRF from MarkPeri International. With over three decades under our belt supplying high-quality RF welding machines to businesses, our reputation is one you can count on. Let us help you find the right PVC welding equipment for your business. We have a wide range of options to suit virtually any company’s needs and budget. To find the right RF welding machines for you, contact us today.